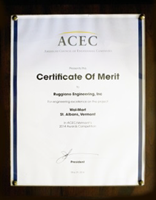 Awards | Ruggiano Engineering, Inc.
Ruggiano Engineering, Inc. has recently been awarded an Engineering Excellence award for the firms work on the Walmart Store in St. Albans. The American Council of Engineering Companies (ACEC) recognized the Walmart Store as an “Outstanding Example of Engineering Excellence”. Ruggiano Engineering, Inc. was one out of many firms that was chosen as a recipient of this award. Ruggiano Engineering has been a major engineering firm serving the Franklin, Chittenden and Lamoille County areas for several years. REI makes it their objective to work closely with clients to understand their strategies and goals for a customized approach toward a project. This achievement was recognized and presented at the ACEC awards banquet on May 29th, 2014. I would like to thank the Franklin County Regional Chamber of Commerce for this recognition. I have to say that it came as a total and complete surprise to me. There are many deserving businesses and business leaders out there who could have easily earned this recognition. I know this, because I work with many of them and it makes every minute of my work day something I look forward to. The success of Ruggiano Engineering comes from being able to work in a community where people are generous in their support and where we can make progress each day on everything from the very small projects to the bigger long term projects that face the difficult challenges of permitting and Act 250. I am very grateful for all of you who I have worked with and I very much appreciate your trust and support. I also want to thank my wife Kim who supported the concept and the implementation of Ruggiano Engineering when we were first starting out. Kim has been right beside me the whole way. I can tell you that we were both excited and nervous when we started the business. There will always be hurdles to jump and hoops to go through and I’m very glad that Kim is there with me each day. Thanks, of course, also goes out to everyone who works at Ruggiano Engineering. We have great teamwork and a fundamental philosophy that our success is only as good as the success we try to bring to all the projects and ventures we work on. I very much appreciate the hard work and dedication that everyone brings to the table every day. As most of you know, we are a Vermont-based civil engineering firm dedicated to personalized service, economical solutions, and successful project implementation. Receiving this recognition means a great deal to all of us at Ruggiano Engineering. I want to thank the Chamber, everyone who works at Ruggiano Engineering and the community for helping us be successful at what we do and we look forward to continuing these friendships and working relationships for a long time into the future.